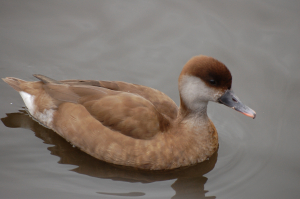 Observation - Red crested pochard - UK and Ireland. Description: Half red head, red finishing just before the top of the bill. Female or Juvenile. Orange on underside of the tip of the bill. Means it's definitely a female. Half red head, red finishing just before the top of the bill. Female or Juvenile. Orange on underside of the tip of the bill. Means it's definitely a female.